I don’t remember how I ran into Jennifer Stay’s Coloring Page Bliss adult coloring video tutorials, but I clearly remember the first one I viewed was her New Secret Coloring Weapon (30+minutes). It impressed me because I’d never thought of using a ‘secret’ weapon like that before with my coloring. Before you go running off to check that out, stay here to watch her 10 minute video on Sharpie Coloring Secrets, Part 1 – where you will learn about the properties of Sharpies to be aware of, best storage solutions and paper most recommended for these pens. I really enjoy Jennifer’s videos because they are informative, interesting and I learn lots of tricks about coloring I didn’t know. 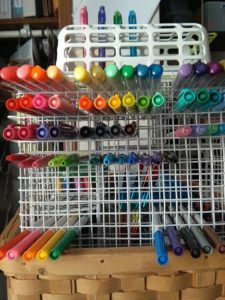 You can use just about anything for storage of your markers, but Jennifer recommends laying them flat so the ink stays dispersed and won’t dry out. I found the wire storage container below at a thrift store. Here are a couple others I like on Amazon. The 3 drawer wood art storage box is definitely on my wish list. 😉 If you consider the 96 hole holder, you might want to use it on its side so the markers will stay horizontal (or flat) instead of vertical (standing up). P.S. Join my email list to get notifications of other cool posts like this! Go HERE.